Whether you have kids or not, chances are you bought Halloween candy, and if you’re like me you have some left over. 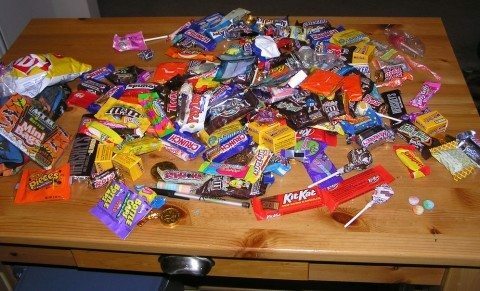 I don’t know about you, but after awhile trying to eat up all those sweets gets old, particularly if have lots of the same kind of candy. Believe it or not, you can do some pretty neat things with that leftover bag of Milky Way candy bars, or that bag filled with all sorts of different kinds of candy that your kids collected. Following are some fun things you can do with all that leftover Halloween candy… from leftover candy recipes, to fun pieces of art you can make, ways you can reuse leftover candy, and how you can pass that candy on to soldiers in the military. #1 Make Apple Candy Bar Salad, or Candy Pudding Cake as well as many other sweets from leftover Halloween candy. #2 Use leftover Halloween candy to make homemade fudge or candy bar cookies. #3 Sell your Halloween candy to someone who can really use it! This is a great idea started by a dentist in Georgia who buys back children’s leftover candy each year and then ships it to soldiers who are fighting in Iraq who may not have many sweets. These days, most dental offices participate in Operation Gratitude. #4 Donate your leftover Halloween candy to a food bank. I think this is a great idea, because while the food banks often give out food necessities, they probably don’t have a budget that allows them to buy extras like candy. #5 Make a Bundt cake with your leftover Halloween candy. #7 Consider placing those extra candy bars in the freezer. (Candy bars are harder to eat when they’re frozen.) This is also a great way to preserve leftover Halloween candy for the future, like maybe Easter so you don’t have to buy any Easter candy! #8 Make a pinata and stuff all that leftover Halloween candy inside. Then, save the Pinata until a special holiday or your child’s birthday. 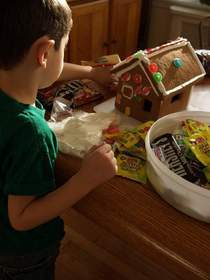 #9 Hang onto your leftover Halloween candy for the Christmas holidays, then use it when you make gingerbread houses. #10 Make a necklace out of leftover lollipops and candies that are twisted at one end of the wrapper. #12 Melt down your chocolate bars for hot fudge syrup or smores. #13 Make your own chex mix by adding pretzels, nuts, and small pieces of chocolate candies. #14 Pack up leftover Halloween candy in small decorative bags and then use it as stocking stuffers. #15 Use leftover Halloween candy to make pieces of art. Use colorful candies in collages, on picture frames, or consider making your own candy sculpture.